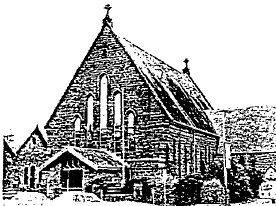 The construction of this church commenced in 1854. In 1857 the nave was built to the design of Backhouse & Reynolds for a cost of £2,000, and in 1868 the transepts were added for a cost of £l, 792 to the design of Edward James. The church is of a simple early English Gothic composition with five imposing lancet light windows to the west elevation. Simple stepped bluestone buttresses separate paired lancet windows on the side elevation. Basalt coping stones, supported, on corbel blocks define the steep gable roof, and are terminated by simple crosses. The effect of this church is drastically altered by the new porch, which destroys the proportion of the west elevation. There was originally a simple entrance portico. However this building provides a contributory streetscape component, and appears to be in good condition.